This guide covers how to go from 0 to 1 with the WordPress SEO plugin and the Customizr WordPress theme. The intended audience is any individual or business owner willing to understand and implement the basics of Search Engine Optimization for its website. This documentation covers the essential steps that will help you to greatly improve the search engines performance of your WordPress website. There's no better definition than the one on WikiPedia, so let's take a look at it. Search engine optimization ( SEO) is the process of affecting the visibility of a website or a web page in a search engine's unpaid results - often referred to as "natural," " organic," or "earned" results. In general, the earlier (or higher ranked on the search results page), and more frequently a site appears in the search results list, the more visitors it will receive from the search engine's users. SEO may target different kinds of search, including image search, local search, video search, academic search,news search and industry-specific vertical search engines. Generating traffic for your site can be done through paid advertisements. But, is there a free way to do it? If readers/customers find your site when they search for particular keywords in a search engine, this free traffic is called organic traffic. Spend some time on optimization of your website and get free organic traffic. As part of your internet marketing strategy, SEO is the most economical way to generate traffic, but it requires time and patience. 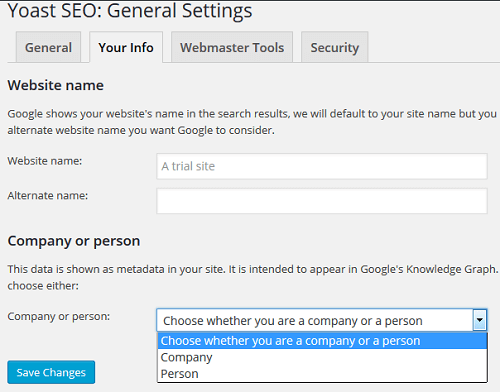 Out-of-the-box, WordPress has features that are SEO-friendly. It guides a search engine through your site's posts, pages, and categories to help the search engine crawl your site and gather the needed information to include your site within its database. Clean code that validates without any errors. Links and Images also contain content, i.e., use keywords and proper descriptions in alt and title attributes. Some of the key SEO features that are needed in a good SEO plugin are listed below. Page Analysis - Ability to analyze content and provide recommendations about focus keyword, meta descriptions, alt and title attributes of images etc. Social Media Integration - Facebook’s OpenGraph and Google Knowledge Graph tags should be built-in for sharing on social media. Permalinks are the URLs of the content you publish on your WordPress website. The structure of your permalinks can be changed at any time. But, doing this changes the URLs of your pages which again affects your traffic. Visitors get to see page errors if you do this at a later point than when you launch your site. It is a good idea to set up clean SEO-friendly URLs even before you launch your site. 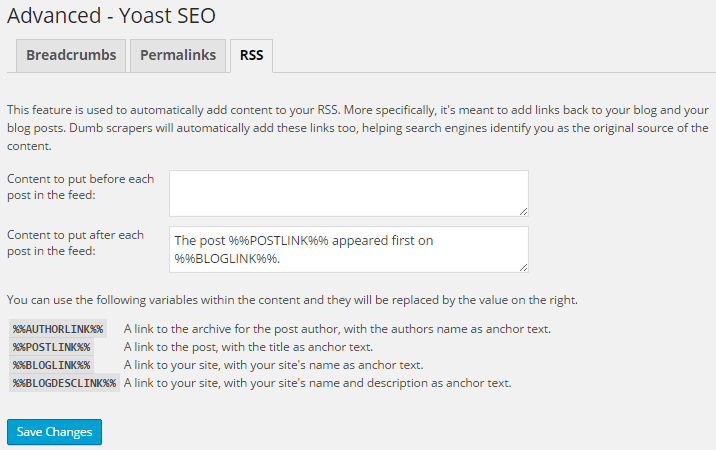 Click on Settings > Permalinks from your site's admin dashboard to view your site's permalinks. Apart from the default structure, there are five custom settings here. The default permalink structure is enabled automatically. The default structure uses a number which is the ID of the post in the wp_posts table in the database. But, this is neither user-friendly nor search engine friendly. Neither can a user remember a post's URL with its ID nor does a search engine find a number (rather than a keyword) in the URL useful. Apart from the default structure, all the other permalink structures are search engine friendly and so are called Pretty Permalinks or Clean URLs. Choose one of the options that are displayed. The following structure tags are available which can be used to change the custom structure field. The keywords used in the post slug can influence the search ranking of the post. 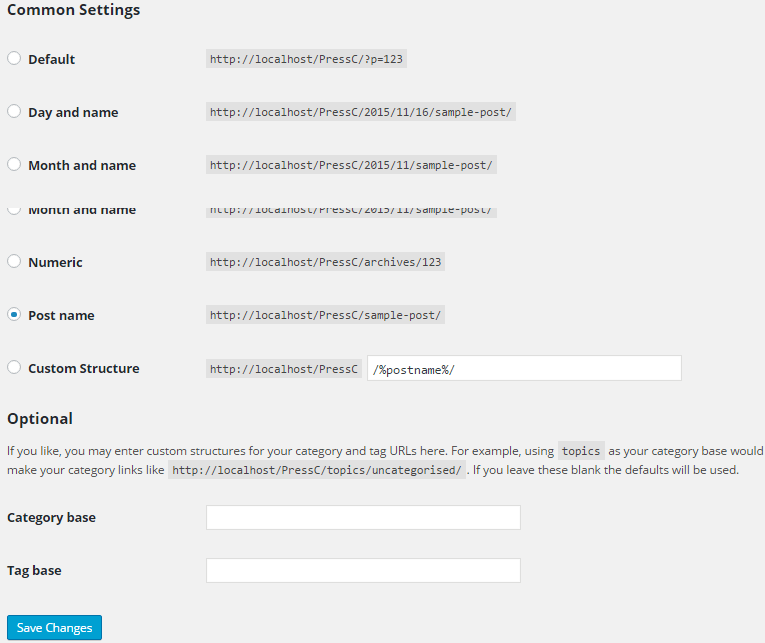 Choose from common settings or create custom URL structures using the above tags. Click on Save Changes button for the new settings to take effect. Installation of the Yoast SEO plugin is the usual routine as for any plugin. 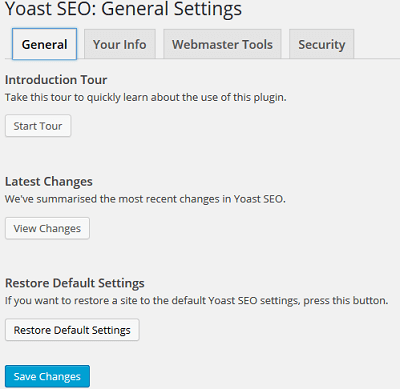 From the WordPress admin dashboard, click on Plugins > Add New and enter Yoast SEO in the Search box. From the results, click on the Install Now button against the plugin. After Installation, activate it and you are done with the installation. But you have to fine-tune the default settings to make it effective. Click on SEO from the admin dashboard and you can see 8 sub-menu items. Each item addresses a particular SEO feature. The General sub-menu option brings up a screen with four tabs. The first tab is General again and this offer an Introduction Tour, the Latest Changes and Restore Default Settings. Click on Start Tour for a tour of the features of the plugin. The latest changes in the plugin are described if you click on View Changes. If you have misconfigured the plugin and you are not sure, you can always revert to the default values by clicking on Restore Default Settings. The next tab is Your Info. The information that you provide here will be used in the meta-data and can provide additional information to search engines. Your website name as entered when you installed WordPress appears. You can also give an alternate name. Specify if you are an individual (person) or company. The third tab is Webmaster Tools. 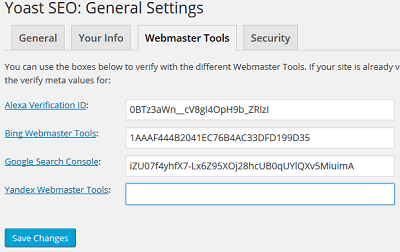 Use this for verifying your site with various webmaster tools. The verification code provided by the webmaster tools should be entered here. The last tab is Security. 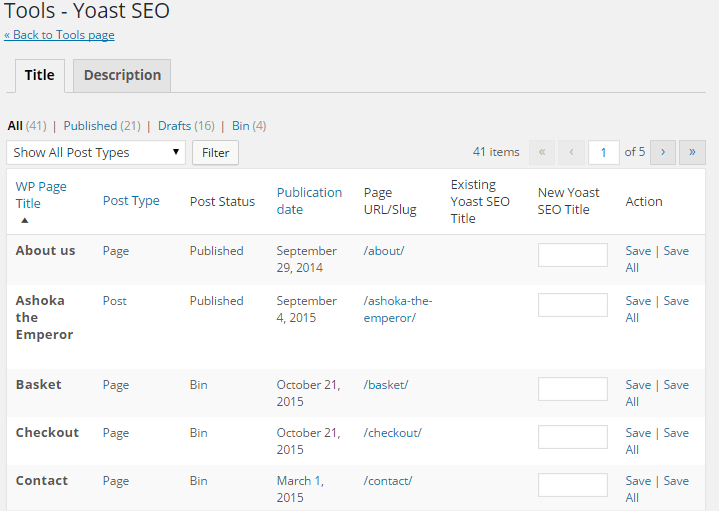 There is not much here except that you can disable certain portion of the Yoast SEO from showing to your authors. There are 6 tabs under this sub-menu option. The first one is General. Not much to set up here. The first option is Force rewrite titles. 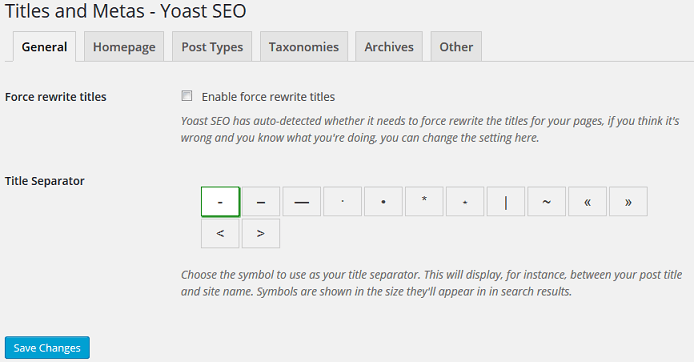 It is a good idea to leave it to Yoast to auto-detect and decide whether to rewrite titles. The next option is to choose a Title separator from the available symbols. This would appear between the post/page title and the site name. The second tab is Homepage. Here you can change the Title template using the available template variables like %%sitename%% for name of the site, %%page%% for the page number, %%sep%% for the separator(chosen in the previous tab) and %%sitedesc%% for description of the site. There are more variables which can be referred to from the plugin documentation. In addition, give an interesting and attractive description of your site against the Meta description template so as to attract visitors. The third tab is Post Types. Here again, for each type of post - Post/Page/Media, specify the Title template and Meta description template. The Meta Robots tag noindex, follow means that the search engines are not to index this post type, i.e. not show in their search results, but follow links in these posts. Check against Date in Snippet Preview if you want the date of publication of the post to be shown in the search results. 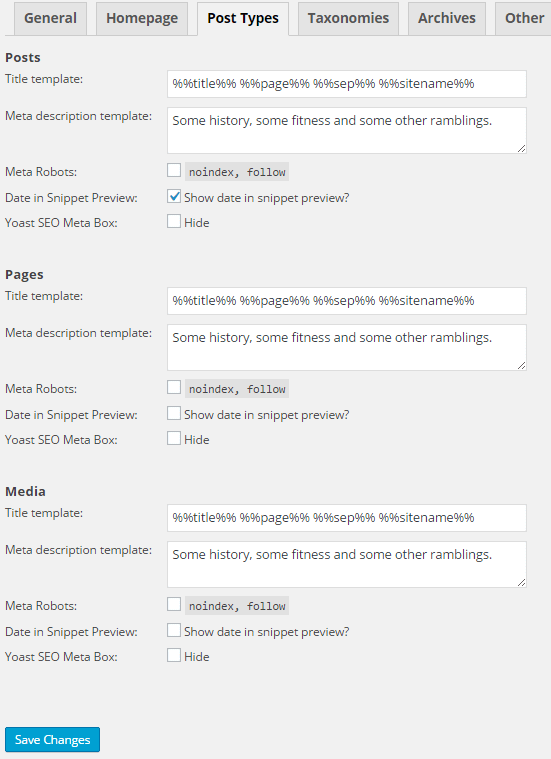 Check against Yoast SEO Meta Box to hide the metabox in the post editor for the particular post type. It is advisable to let it be shown for posts and hide it for pages and images. The fourth tab is Taxonomies. 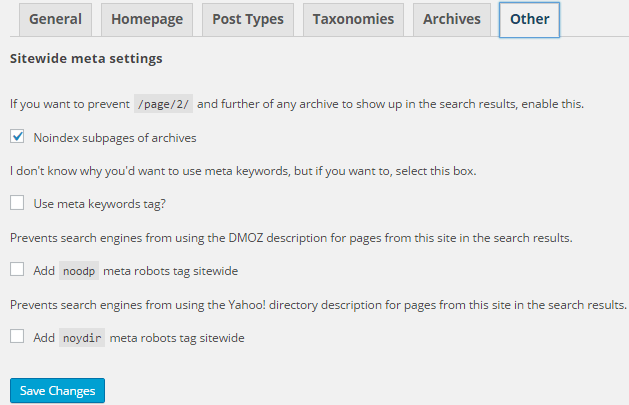 All Taxonomies detected, including the default Categories and Tags are displayed here. 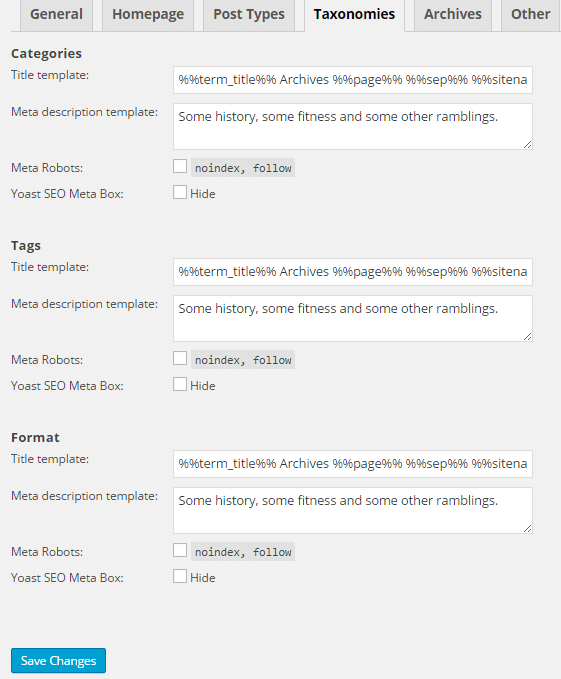 You can customize the Title template, Meta description template, Meta Robots and Yoast SEO Meta Box which we discussed under Post Types tab for these Taxonomies as well. It is recommended to use some judgement in decide whether to check against Meta Robots for each taxonomy. The fifth tab is Archives. 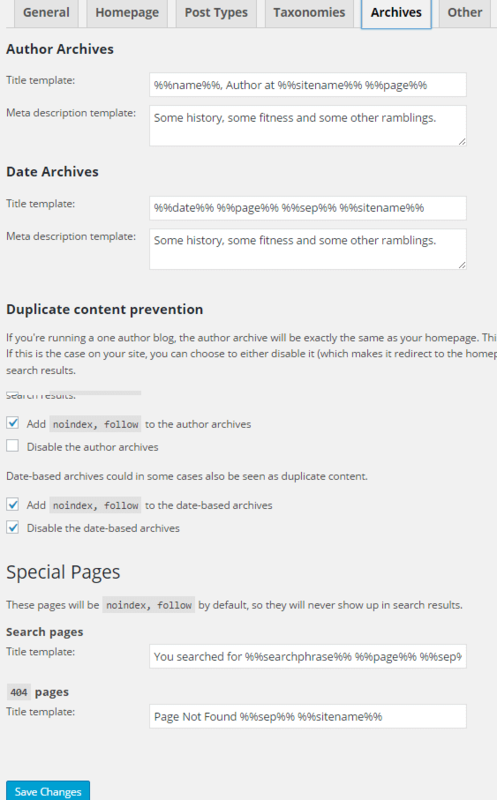 Here you can customize the template options for Author Archives and Date Archives, similar to the Post Types. Do check against Add noindex, follow for each of the archives to prevent duplicate content. In addition, it is here that you can customize the message shown in the site-wide search results page and the 404-error page. The last tab is Other. This tab takes care of the Sitewide meta settings. Check against Noindex subpages of archives so as to have only the first page of archives to be indexed and not some middle page. Leave the other options. The next sub-menu item is Social. The options permit you to optimize your site for social media and links. The meta data will get inserted into your posts and pages so that your content is better integrated into the social media. The first tab here is Accounts, where you specify your account URL on various social media like Facebook, Twitter, Instagram and others. This is followed with the setting tabs for the most important and widely used social media. Facebook is the first of these. Even if you don't use Facebook for your site, check against Add Open Graph meta data so that your posts shared by others on Facebook carry the metadata. You have to give the metadata for your Frontpage (You can copy this information from home metadata or provide something different) and also the default image to be used for a post if the post does not have an image. Associate your website with a Facebook profile to get access to Facebook Insights for your site. This can be a user (Facebook admin) profile as well as a Facebook app. Twitter is the next tab. You can add Twitter cards in the header of your site. It is recommended to choose the card type as summary with large image. Pinterest follows. It uses Open Graph meta data just like Facebook. 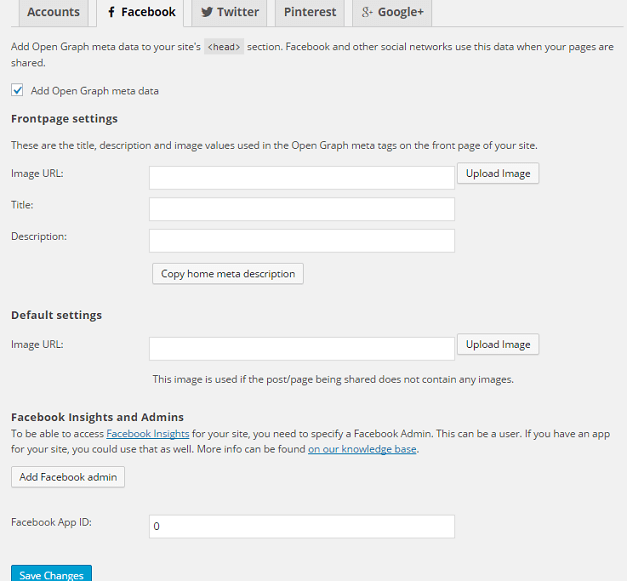 Make sure that you have open graph meta data box checked under Facebook settings. Enter the site verification meta tag provided by Pinterest. Last comes Google+. 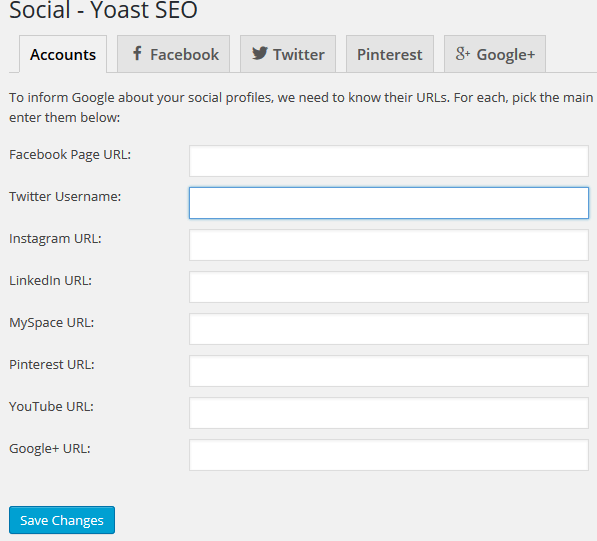 Check against Add Google+ specific post meta data to add Google+ related data for posts. If you have a Google+ page for your site, enter its URL against Google+ Publisher page. Sitemaps are very important for your site because they help to get indexed and notify search engines about your content. Before looking into each tab and the options there, ensure that you check against Check this box to enable XML sitemap functionality. The first tab is General. You need not change anything here. 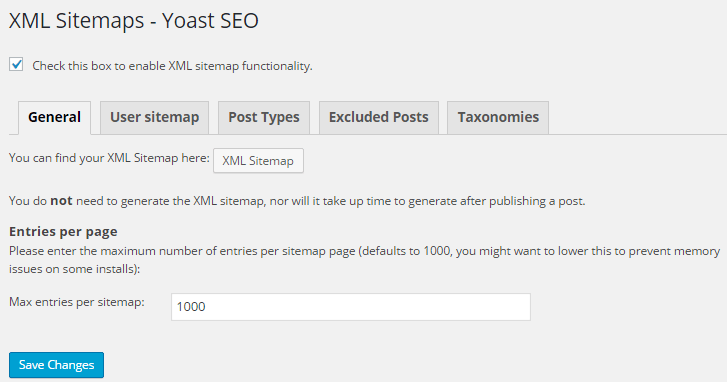 If you click on XML Sitemap button, you can view the sitemap for your site. The next tab is User sitemap. 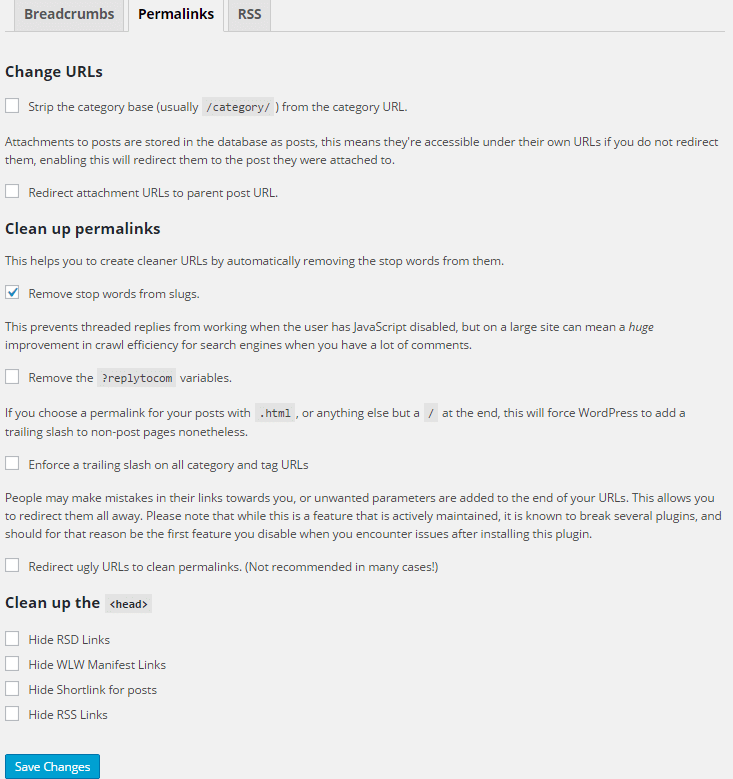 Go ahead and disable author/user sitemap. The third tab is Post Types. By default, Media are excluded from sitemap. If you have custom post types, exclude them too. The fourth tab is Excluded Posts. Remove individual posts, pages, or custom post types by entering the unique post IDs. The last tab is Taxonomies. If you want any custom taxonomies to be excluded, this is the place to do it. On to more advanced options under Advanced sub-menu item. The first tab here is Breadcrumbs. 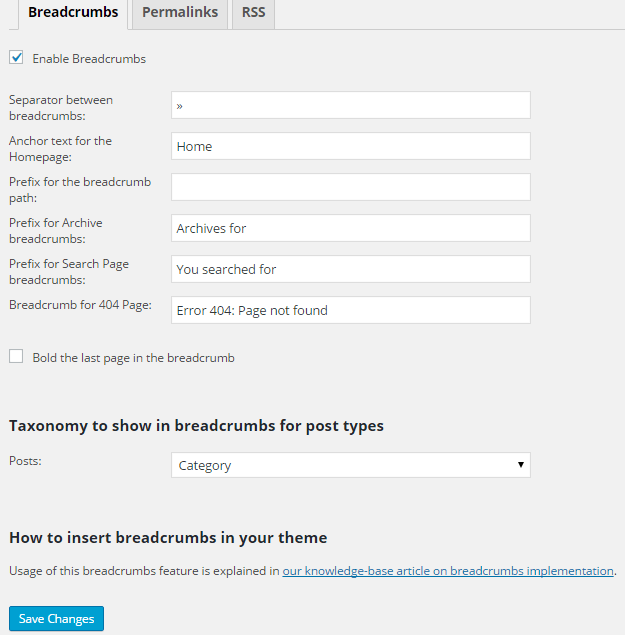 Customizr theme itself has the Breadcrumbs feature. So, this is a redundant setting for users of Customizr. The second tab is Permalinks. The options here are in addition to setting up clean URLs which was discussed in the Pre-requisites. You can remove the category base in each url /category/ that is added by default by checking the first option. When users reach attachment URLs, if you want them to be redirected to the parent post, then check against Redirect attachment URLs to parent post. Stop words are frequently used functional words like is, are, a. By removing these, the keywords only remain in the post slug. So, check against Remove stopwords from slugs. Check the next option because removing ?replytocom variable from comment reply links can increase crawl efficiency. If your permalink structure is such that it does not end with /, then check Enforce a trailing slash on all category and tag urls. Safely leave the next option as it is. Check Hide Shortlink for posts under Clean up the <head>. Check Hide RSD links and Hide WLW Manifest Links as well if you do not use a client to update your site. The last tab is RSS. This is to customize the RSS Feeds section. You can add content before and/or after each post in the feed. You can use template variables to add your author link, post link, blog link, and blog description. The sixth sub-menu item is Tools. This contains some powerful tools. The Bulk editor can be used for editing your posts in bulk. WordPress has a bulk editor, but this one is more powerful. you can alter more attributes like the Publication date and SEO Title in bulk. Isn't that handy? 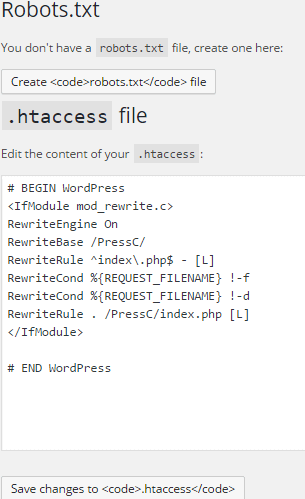 The next tool is the File editor which gives to access to the robots.txt and .htaccess. Customize these files without moving out of your WordPress admin dashboard. The last tool is Import and Export, which is again powerful and helps you to import and export posts with more features. The seventh sub-menu is the Search Console. It lets you connect your site to Google Search Console tools/Webmaster tools. Enter the Google Authorization Code and complete the verification process. Select your website as your profile. Your Search Console data will be pulled into WordPress. You can see Desktop, Mobile, Feature Phone tabs on screen. The eighth and last sub-menu item is Extensions. Here the available extensions for this plugin are displayed with the links to get them. There is a tab for entering the licences for these extensions too. That was long, but let us face it. SEO is not a quick-fix job. 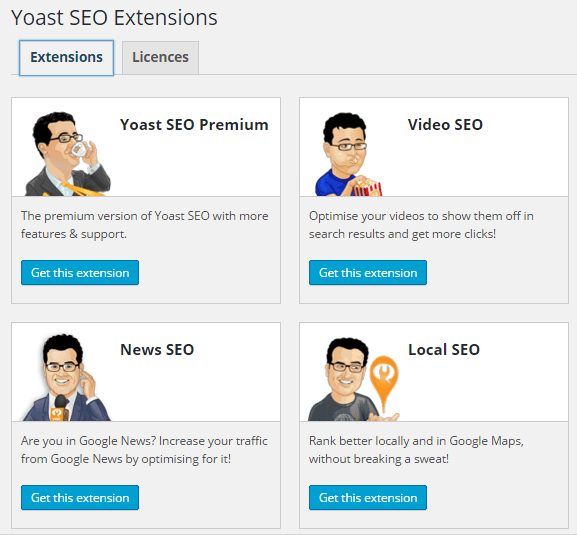 SEO involves long hours and Yoast SEO makes it easy to start with. Most of the default configurations work just perfect. If you want to get deeper and dirty your hands, these are the options and you can use them. If not, let the default reign !